6.30-8.30pm in the school hall. Disco is for Conifer Grove School children only – any preschoolers must be supervised by an adult. 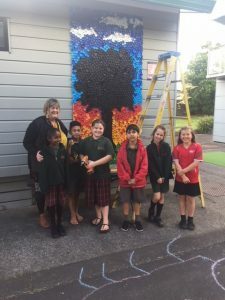 Thank you to everyone who contributed bottle tops – look at the amazing new artwork Mrs Denton’s Art Group have just completed. Next weekend the school holidays will almost be over! ……. How about you fabulous hard working ladies treat yourselves to a night out at the movies with your friends and come and see the hilarious movie “Book Club”. You will receive a goodie bag filled with treats such as Sals pizza vouchers, Scentsy and Ecostore products, Australis nail polish, Revlon & much more . If you feel like a glass of wine or a snack for the movie there will be items available for purchase and we will also be running raffles, one of which is for a beautiful Pandora bracelet. All tickets purchased by October the 10th will go into the draw for a prize. And there will also be spot prizes on the night! See you there to support Conifer Grove School.